How do I install the Firefox Extension manually? Make sure to save the file to a location you can quickly access. Go back to Firefox, and click the menu icon at the top right, then click "Add-ons". 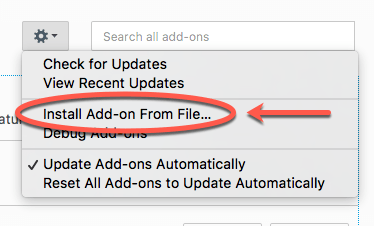 Click the "Cog" icon at the top of the screen, and choose "Install Add-on From File..." Browse to the location of the file we just downloaded and select it. If prompted, press the "Add" button at the top left of the screen. For more information on how to use the VirtualShield Firefox extension, please check out our article, Getting Started with the Firefox Extension. If you need further assistance, please don't hesitate to contact us.